Pudding was a very important part of the meal in the Victorian era. The lower classes did not eat pudding very often and it was seen as a frivolous luxury that few could afford. Desserts such as cakes, plum puddings, trifles and jellies were very popular with the middle classes. 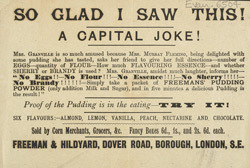 The pudding powder advertised on this leaflet would have been an early version of custard. Because only milk and sugar needed to be added to the powder it was a very cheap, easy and quick dessert to finish off a meal.